Japan’s exports shrank for a fourth straight month in March as weakness in global demand continues to weigh on the economy. One of the bright spots in recent data -- increasing shipments to the U.S. -- could darken if trade talks with the Trump administration that began this week turn sour. The value of exports to the U.S. rose for a sixth month, by 4.4 percent, generating a bilateral surplus of 683.6 billion yen ($6.1 billion) in March, according to the finance ministry in Tokyo. Sales to China slumped, driving a 2.4 percent drop in total exports. The figures came as negotiators wrapped up an initial round of trade talks in Washington that are being used by the U.S. to try to crack open Japan’s agricultural market and reduce America’s trade deficit. Japan has managed to dodge the talks for two years and is now trying avoid tariffs or quotas on auto exports, and a possible currency clause. The latest figures all but confirm that exports will drag on the economy in the January-March period, for the second time in three quarters, meaning that Japan must rely on domestic demand to hold up growth. U.S. lawmakers, especially those representing agriculture interests, have been pressing the Trump administration to quickly wrap up a deal with Japan to counter any lost market share American farmers have been suffering over the past year as competitors such as Australia benefit from a multilateral deal spurned by the U.S.
Japan’s economy minister Toshimitsu Motegi said he would be back in the U.S. next week to meet U.S. Trade Representative Robert Lighthizer. Motegi said discussions will now take place at an accelerated pace to reach a deal quickly. Japan’s March data is seen as the most reliable gauge of shipment strength this year given the seasonal holiday factors that distort export figures in large parts of Asia in January and February. "Looking ahead, the signals for exports are mixed. ... 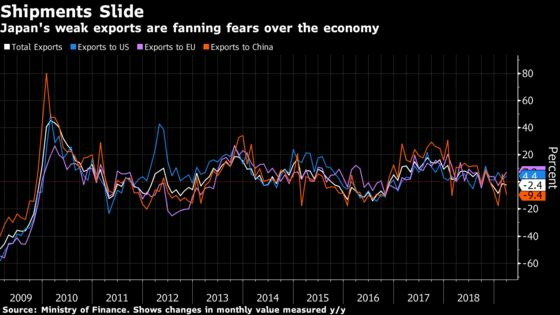 Some positive economic signals from China could mean exports may stop falling, but we doubt external demand is strong enough to spur a rebound. ... The biggest risk going forward -- U.S. protectionism." Imports rose 1.1 percent in March, compared with a 2.8 percent gain predicted by economists. The trade balance was a 528.5 billion yen surplus in March, compared with a median forecast for a 363.2 billion yen surplus. Exports to China decreased 9.4 percent in March, while shipments to U.S. climbed 4.4 percent and sales to Europe advanced 7.3 percent. "For U.S.-Japan talks, it will be tough for Japan," said Yuichi Kodama, chief economist at Meiji Yasuda Life Insurance Co. in Tokyo. "The currency clause, auto, and agriculture are the three main points to look at. The currency clause itself is nothing to be afraid of, but we need to see whether yen would get stronger if a clause is included in the deal."